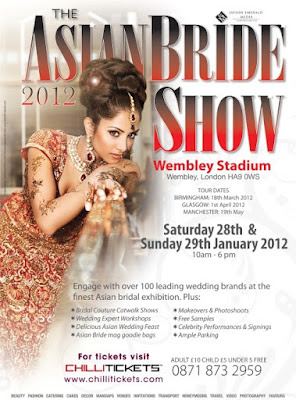 Asian Fashion Blog: The Asian Bride Show 2012 in London - book your tickets now! Hi i am a free lance make up artist and would love to offer my services for the catwalk make up. is this possible at all? Hi..I just wanna know what is the dress code for the show...or I can wear Sari?? as far as I know there isn't a strict dress code so you can wear a sari if you want to. I'll personally be wearing jeans as it's a daytime event and I want to be comfortable. At peak times the exhibition stands can get quite busy so there's that to think about too. hey can you tell me about the colors which are in fashion this year for Asian bridal wear. Please reply me yar. hi SM, red is always in fashion for asian bridal wear, but I guess that's a bit of an obvious answer! I will be posting my report from the fashion show at the Asian Bride event so I'll let you know then...but regardless of what's "in" I think it's better to find a colour that suits the individual bride rather than just going by what's on trend. Thank u so much.. Asal me I'm learning Fashion Designing. I'm confused v. much this time. Any way, Thanks again..
Hi when is the next asian bride show?